"CEO Talking Points" used by former Treasury Secretary Hank Paulson confirming that the nine bank CEOs present at the October 13 meeting had no choice but to accede to the government's demands for equity stakes and the resulting government control. The talking points emphasize that "if a capital infusion is not appealing, you should be aware your regulator will require it in any circumstance." Suggested edits of the "talking points" by Tim Geithner, then-New York Fed President, were withheld by the Obama Treasury Department. "Major Financial Institution Participation Commitments" signed by the nine bankers on October 13. The CEOs not only hand wrote their institution's names but also hand wrote multi-billion dollar amounts of "preferred shares" to be issued to the government. Email documenting that, on the very day of the meeting, the Chief of Staff to the Treasury Secretary and other top Treasury staff did not know the names of any of the banks that would be in attendance. Email showing Treasury officials wanted to use the Secret Service to help keep the press away from the CEOs arriving at the meeting. Email showing a public relations effort, run in part out of the Bush White House, to tamp down public concerns about "nationalizing the banks." 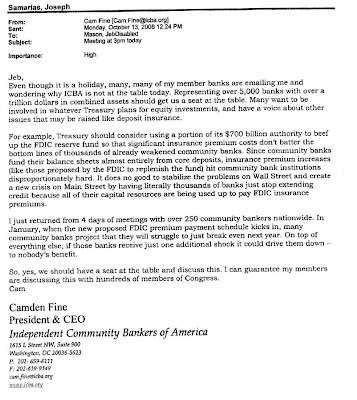 Email showing that Paulson was able to brief Barack Obama about the bankers meeting almost immediately, but could not reach Senator John McCain. If anyone had any doubts of how the financial elite of the United States conducts "negotiations" before now, this should put essentially all questions to rest. The real question is how long will the population continue to tolerate this kind of bully approach by the key powers that be, especially since these same individuals lied and said that nobody had been forced to accede to any demands. Maybe justice will finally prevail in the Lewis - Paulson - Geithner showdown, in which as everyone knows, at least one of the three hast to be lying. Also, combing through the emails reveals this little gem of information. It is good to see that the Treasury's Chief Of Staff is mostly transfixed by just how the market reacts to any gust of the wind. Also amusing is the commentary from Cam Fine of the Independent Community Bankers of America, whose lack of an invitation to the 3pm Oct. 13 festivities made him feel like a jilted ex-girlfriend. Don't worry Cam: not being one of the too big to fail means you will still have your job long after Lewis, Vik and Blankfein are dead and burried history. Nonetheless, ironically, Cam has done one of the best jobs of analyzing the impact on the FDIC if community banks continue to be seen as just ugly step children of the Wall Street Big 9. I specifically refer to the second paragraph in the e-mail below. Way to go Cam - you tell that Sheila Bair who is in charge. 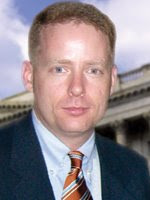 As for just who Hank Paulson's Chief Of Staff is, that is clueless as to who the biggest banks in America are, and is more focused on the futures of the Dow than the S&P, I present the picture of Jim Wilkinson, UT Arlington alum, and former Phi Gamma Delta brother, below. For people who are curious what the immediate response of Hank "Bald" Paulson was to the effective nationalization of the entire U.S. banking system, I present the e-mail below.